One of our precious snow leopard triplets did not survive his turbulent first weeks. The now six-week-old cubs have been well cared for by their mother Helen in their behind the scenes maternal den, but each of the cubs has displayed health concerns that have caused our keepers and vet staff to go into overdrive trying to help the cubs pull through these challenges. Unfortunately, we had to make the difficult but humane decision to euthanize the male cub yesterday after we determined that the little guy had multiple, severe heart defects that were causing early heart failure. Dr. Darin Collins, the zoo’s Director of Animal Health, tells us that it’s very rare to encounter disease concerns in the zoo’s newborn animals that are too severe for modern medicine to overcome, but in this case, there were no surgical or drug treatment options available. As you can imagine, we are heartbroken by this loss. But our dedicated zookeepers and veterinary team have the two surviving sisters to focus on, especially as the girls are facing their own challenges. 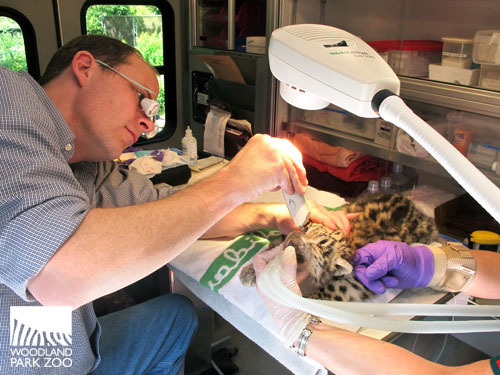 Volunteer veterinary ophthalmologist Dr. Sullivan examines a female cub’s eyes. Photo by Kirsten Pisto/Woodland Park Zoo. All three cubs have been diagnosed with congenital eyelid defects, also known as colobomas, a malformation in which a portion of the structure of the eye is lacking. Our vet crew teamed up with Dr. Tom Sullivan, the zoo’s volunteer veterinary ophthalmologist with the Animal Eye Clinic (Seattle), to perform the first of multiple minor procedures to the eyelids, which involved tightening the loose and folding eyelid tissue with sutures. The defect has left one female cub with only one functioning eye. Though the good news is the one eye she has seems to be the strongest of all the cubs’, and she’s proven to be a lively and feisty kitty despite her challenges! Dr. Sullivan will perform additional corrective surgery when the cubs are 3 to 4 months old. Their father, Tom, was born with this same condition and snow leopards at other zoos have been reported to have colobomas. The overall prognosis for our two girls is good but guarded, as there is the potential for complications that we’ll have to monitor for as Dr. Sullivan returns weekly for re-checks. Female cub recovers from her procedure before being returned to mom. Photo by Kirsten Pisto/Woodland Park Zoo. Helen continues to be a very attentive mother and is providing excellent care for the cubs, who despite it all, are gaining weight and developing mostly as expected. The young family will have to adjust to the loss of the male cub, but we expect Helen to continue bonding and nursing with her remaining cubs based on the strong maternal care she’s shown already. Helen and Tom did sire two healthy cubs in May of 2009, so she has experience. Snow leopards are endangered in the wild, and their birth at the zoo is cause for celebration, introducing a new generation of wildlife ambassadors to help inspire zoo visitors to join us in conservation efforts to save this incredible species. It’s heartbreaking for us to see this beautiful family struggle so much in these early weeks, and we appreciate your support as we monitor their progress and do all we can to give these cubs a healthy, quality life in spite of their challenges. I'm so sorry for your loss. The zoo staff must be devastated. The work you do to help preserve this beautiful species and educate the public is exceptional. We love you for it, and I wish you peace and light as you mourn the loss of this special little one and move forward in caring for the two sweet cubs remaining. This is very sad indeed for all of that were excited about their birth and waiting to see them. Expically sorry for the sarrow the staff and vets must be feeling. So sad. We have been so looking forward to seeing these cubs. So sorry you had to make the decision for the little boy. Here's hoping the two girls continue to grow stronger and healthier. Our thoughts are with you. Hope the young "girls" continue to grow & thrive. Looking forward to seeing the family soon. So sorry for the loss of your young male cub. Prayers to the WPZ staff and caretakers of the snow leopards. Good thoughts and prayers for the "girls" to continue growing and thriving. So heartbreaking. So sorry, I know its difficult especially with a species that is diminishing. My thoughts to all zoo staff. so sorry to read this. We visited yesterday, and the Snow leopard in the viewing area was a wonder to observe, and even "meowed" at us. Hope the Little girls do well. It is always sad to loose a child, human or snow leopard. Our thoughts go out to all at Woodland Park. I know you zoo people follow each other all over the world. In Tallinn Estonia this spring we followed via webcam three snow leopards born. The young mother Mahnadi did not have milk or she just did not know how to cope with the cubs. The cubs were at once taken to the good care of zoo's staff. They survived and are all well know.